Our custom designed KIDS plans offer you a terrific opportunity to have a Gary W. Sweetman portrait at a fraction of our regular costs. We have an almost limitless selection of studio backgrounds and props to make your portrait really unique! Black & White, Tones (like Sepia or hypercolor) are also available as are specialty images & our fab composites. Our Regular Sitting: Up to 3 looks! Two clothing or background changes are included. Your portrait can be in our studio or nearby environmental (park, outside your home, etc) head and shoulders, 3/4, or full length. It can be with your pet, or include siblings mixing the 3 “looks” within a family. These photos include basic retouching on a single image and your choice of: 1-8x10 or 2-5x7 or 4-4x6 for one pose for only $169.95 – or two as web-share files. (Instagram-Facebook-Snap)! Extras: Additional clothing changes, addition or deletion of subject, mixing in studio and environmental, interiors other than studio: add $69.95. This also includes our fabulous retouching on a second image! 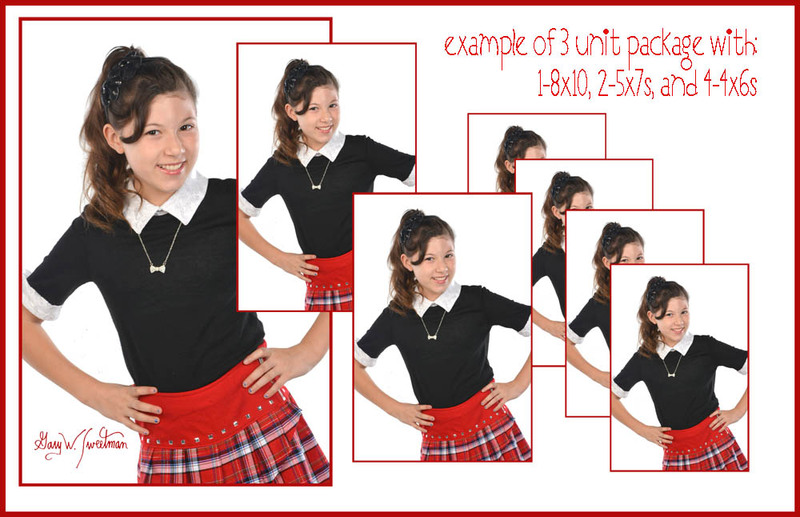 Each package contains Three print units – a unit is 1-8x10, or 2-5x7, or 4-4x6. Examples of a three-unit order are: 2-8x10 and 2-5x7, or 1-8x10 and 8-4x6, or 4-5x7 and 4-4x6. Get the idea? Each package must be from one pose. Multiple packages (like Pick any Three) can be from 3 different poses. Each 3-unit package below may be a different pose. Our regular, custom prints, mounted, sprayed, and minor artwork inc. at a terrific discount! Images on CD: (Facebook & Web-Sharing resolution-you cannot print from these files) First image: $16.95 thereafter: $12.95 (retouched if prints have been previously ordered) SLIDESHOWS set to Music: Ask to see some examples. They start @ $99 with MP4 webshare included. Birth Announcement or First Communion Cards: -4x8 Custom cards & envelopes for Celebration Invitations. 2 photos & custom text. . Design & first 25= $69.95. Additionals & envelopes $1.99 each. Kids Hardcover Books//Photo/Illustrations/Composites/Watercolor Fantasies and Canvas Wraps- State of the art technology blends with the centuries old technique of handmade papers and canvases to create an art piece uniquely yours. Reminiscent of Monet’s water lily paintings, the delicate tones and textures of a watercolor palette stylistically enhance each custom piece. In addition, we offer digital composites that can beautifully combine multiple heirloom images, text & even existing photos, blending multiple images of you, your loved ones (including parents and grandparents for a multigenerational look), and even objects – like awards – into a unique portrait to be treasured for generations. Our digital composites begin at just $95 with 3 images and one line of text – in addition to your print costs. Canvas Wraps: Wall portrait 1 ½” wrapping starts @ $99. (+print) Kids Hardcover Books: A wonderful way to remember childhood. 8x8 & 8x11 hardcover books with twenty pages are $399 with additional pages including design $19. Duplicate books (thank you gifts?) are only $89. Gary W. Sweetman Photography has been serving its clients since 1971 with outstanding portraiture and innovative commercial photography. His exciting style of contemporary portraiture was born from a background of fashion and theater photography. He was production photographer for Asolo, the State Theater Co. of Florida for 15 years. He was one of only 11 people, since 1957 to receive his "Q" degree from the Professional Photographers of America for excellence in Theater Photography. He also holds his C.P.P degree from that organization. His commercial photography has appeared in G.Q., Women’s Wear Daily, Architectural Digest, The Wall Street Journal, Progressive Architecture, Time, Architectural Record, Estates, Unique Homes, and many other regional publications and trade magazines. Mr. Sweetman is a sought after judge and lecturer, giving seminars to professional peers everywhere, including Stockholm, Sweden on contemporary fashion lighting techniques. We were voted (again) the #1 Studio in the 2015 Bradenton Herald Reader Poll and #1 in the 2016 Sarasota Herald Tribune poll. We welcome the opportunity to create your portrait.